Good health is largely determined by our bodies' ability to detoxify -- flushing out the toxic substances that can be found in everything from the air we breathe to the food we eat. It's absolutely critical to support the body's detoxification systems to promote optimum health, and a three-to-five-day fresh fruit and vegetable juice fast -- performed once every three to four months -- is a great way to do just that. Juice fasting can help reduce some of the side effects associated with a water fast, such as light-headedness, fatigue, and headaches. While on a fresh juice fast, people typically experience an increased sense of well-being, renewed energy, clearer thought, and a sense of purity. Although a short juice fast can be started at any time, it's best to begin on a weekend, when you are more likely to get plenty of rest. The more rest, the better, as energy can be directed toward healing instead of toward other body functions. Prepare for your fast on the day before by making your last solid meal one of only fresh fruits and vegetables (some experts recommend a full day of raw food). For the next three to five days, you should consume only fresh fruit and vegetable juices (ideally prepared from organic produce), four 8- to 12-ounce glasses throughout the day. Virtually any fresh juice can supply detox support, but some of the best include beets, carrots, celery, apples, and/or pears. In addition to fresh juice, drink plenty of pure water -- at least four 8-ounce glasses per day, or more as dictated by thirst. There's no question that the fresher the juice, the greater the health benefits. 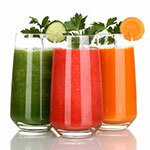 Fresh, unprocessed juice is full of live enzymes and the most active forms of many health-supporting phytochemicals. The pasteurization process in the production of commercial juices destroys many of these compounds, and actually alters the structure of vital nutrients that are important in fighting against viruses, cancers, and damage to our cells. During your fast, avoid coffee, soft drinks, sports drinks, or any other processed beverage. Herbal teas, on the other hand, can be supportive, but they shouldn't be sweetened with anything other than perhaps stevia (or other natural sweeteners). Exercise isn't usually encouraged while fasting. It's best to conserve energy and allow maximum healing. Short walks or light stretching are okay, but heavy workouts tax the system and inhibit repair and elimination. Cleansing the skin with lukewarm water is encouraged, but temperature extremes can be tiring. And avoid conventional deodorants, soaps, sprays, detergents, synthetic shampoos, and other chemicals that hinder elimination and add to the body's toxic burden. Rest is one of the most important aspects of a fast. A nap or two during the day is recommended. Less sleep will usually be required at night, since daily activity is lower. Body temperature usually drops during a fast, as do blood pressure, pulse, and respiratory rate -- all measures of the slowing of the metabolic rate of the body. It is important, therefore, to stay warm. When breaking your fast, remember to eat slowly, chew thoroughly, and avoid overindulgence. While breaking a fast and in the days that follow, it can be very helpful to record what you eat and note any adverse effects. Many of today's health problems stem from food allergies and overeating. 1. Take a high-potency multiple vitamin and mineral formula to provide general support. 2. Take a liver-supporting lipotropic formula, which is available at health food stores. These formulas are typically rich in choline and methionine, two important nutrients for the liver. Take enough to provide a daily dose of 1,000 mg of choline and 1,000 mg of methionine and/or cysteine (such as N-acetyl-cysteine or NAC). 3. Take 1 gram of vitamin C three times daily. 4. Take 3 to 5 grams of a water-soluble fiber supplement at night before going to bed. The best include powdered psyllium seed husks, guar gum, apple pectin, and PGX. 5. Give your liver some extra support by taking a special extract of milk thistle known as silymarin. The dosage is 70 to 210 mg, three times daily. Finally, remember that although periodic short juice fasts are helpful, you also need to adopt a healthy regimen overall to truly support your body's detoxification process. Maintain a high-fiber diet augmented with foods rich in detoxifying nutrients, including legumes, onions, and sulfur-rich garlic; foods rich in water-soluble fiber such as pears, oat bran, and apples; and cruciferous vegetables, especially broccoli, Brussels sprouts, and cabbage. Other key detox-promoting foods include artichokes, beets, carrots, dandelion greens, and a variety of herbs and spices, including turmeric, cinnamon, and ginger. Resume your normal, healthy diet.